When they were built, the locks at the Panama Canal could hold any ship in the world. 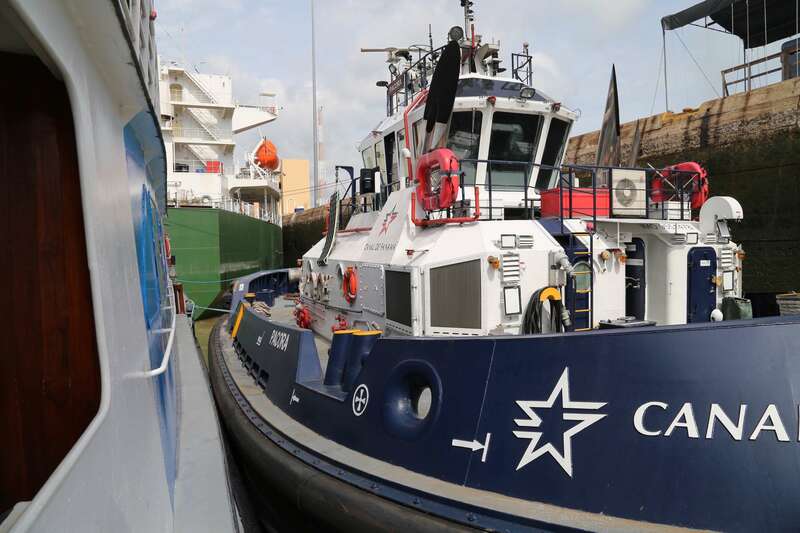 At 110 feet wide by 1,050 in length, some ships, like the Ocean Glory, can barely squeeze in. The Ocean Glory eases into position at the Miraflores locks of the Panama Canal while the tugboat waits for a ship filled with tourists to pull alongside. Today, the Panama Canal is a thriving and efficient method to move ships, cargo, and people between the two largest oceans on the planet. Yet, for hundreds of years a canal across the Isthmus of Panama was a pipe dream. But before the first ship steamed through in 1914, the massive project would claim more than 30,000 lives, advance the fields of engineering and manufacturing, cause a mighty nation to teeter on the edge of bankruptcy, reshape the geopolitical map of the world and fulfill the grand ambitions of an American president. Birds flying overhead are opportunistic. As the lock fills with fresh water from a dam, the saltwater fish are stunned and the birds snag a free meal. Early European explorers were first taken with the notion of a canal, both in what is now Panama and also in Nicaragua. The Panama route was shorter, at only 48 miles or so, with much of the way being large freshwater bodies. A canal across Nicaragua would also traverse land and water, would be more than 160 miles long, and surprising to some is an idea that still has backing. 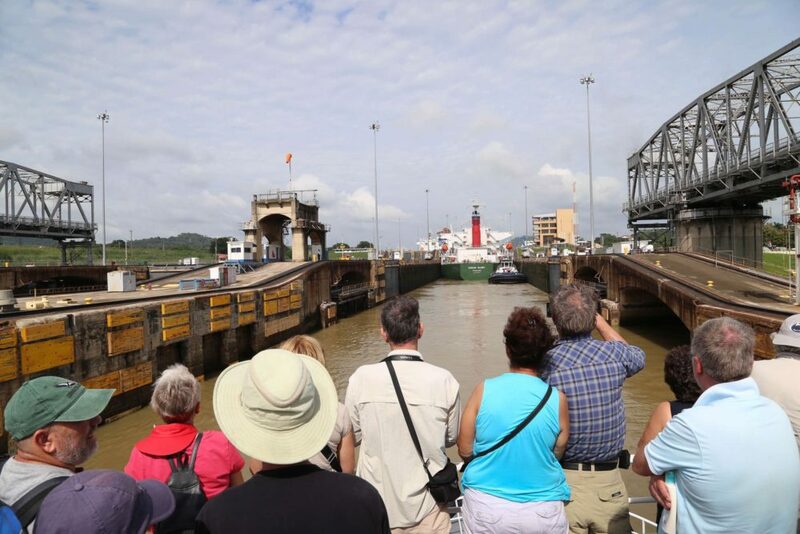 The Panama Canal is a must-see bucket list item that visitors from around the world come to see in action. There are six sets of locks at the original Panama Canal; three on the Atlantic and three on the Pacific side. Each lock pairs with another lock for ships headed in the other direction, as seen here, making 12 locks altogether. 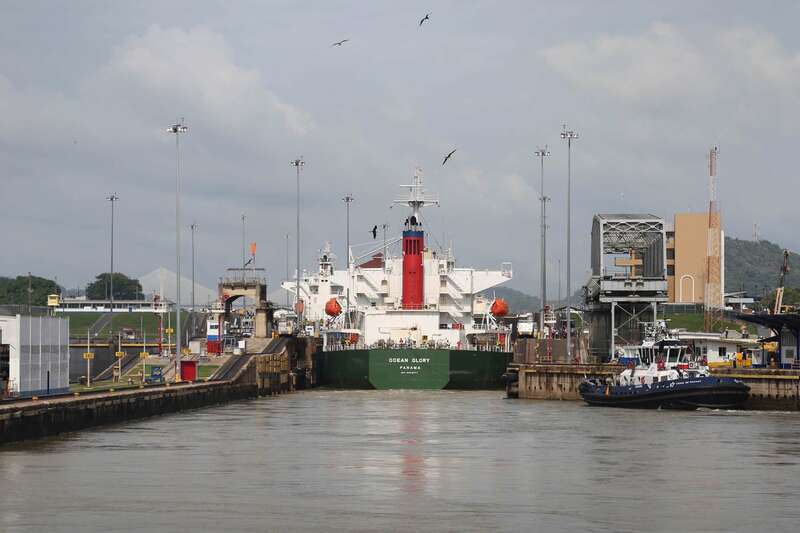 The first serious effort to construct a canal across Panama began in the 1870s, though considerable maneuvering and negotiations had been underway decades before that. Fresh water fills the locks flows from a dam that impounds the Chagras River. The water is gravity-fed, eliminating the need for generated power. French interests were the early players and the notable driver in that effort was Ferdinand de Lesseps. Among his many impressive achievements, he was the force behind the creation of the Suez Canal (later taken over by Great Britain). At Panama, Lesseps was convinced the way to go was dredge the land and waterways and create a sea level canal, like he did at Suez (which opened in 1869), that had a distance just over 100 miles. The locks are huge upon approach, but canal personnel don’t want to waste water so as many ships and boats as possible are tucked in. 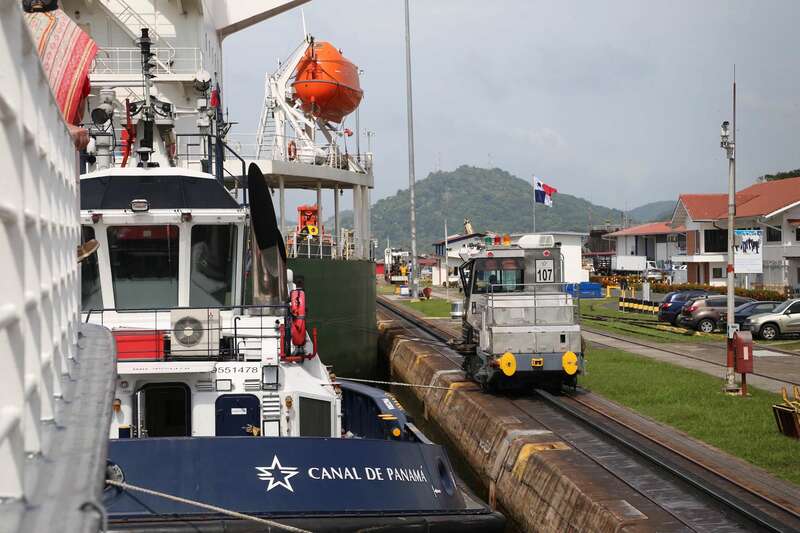 Locomotives, one at the bow, the other at the stern, run alongside each lock at the Panama Canal to transport larger vessels up, down and through the six locks required to transit the entire canal. Lesseps, a respected diplomat, and honest man with indefatigable optimism rallied strong support from French investors who flocked to purchase investment bonds. They were convinced that Monsieur de Lesseps would repeat his great success and demonstrate France’s engineering and construction abilities to the world. 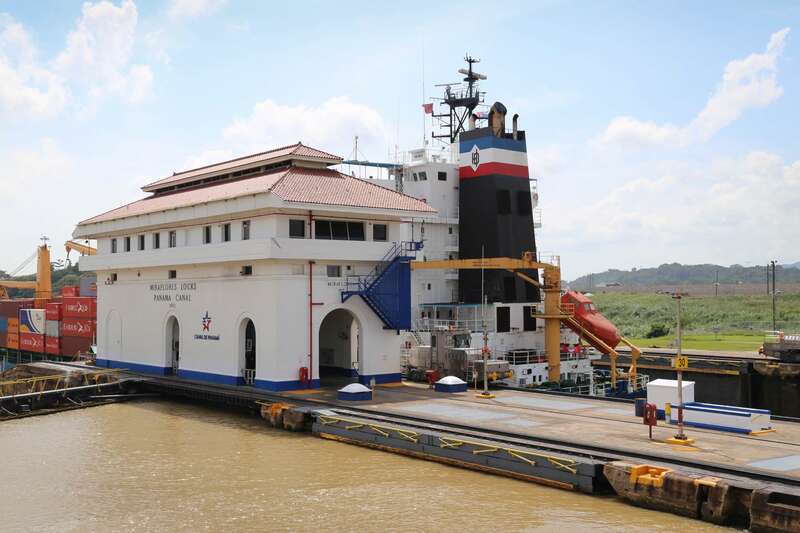 The Miraflores Visitor Center at the Panama Canal offers sweeping views of the canal. Lesseps was wrong on virtually every one of his assumptions when he thought Panama would be a repeat of his experience in Egypt at Suez. His stubborn refusal to alter his plans would prove tragic, costly, and greatly embarrassing to him and France. Only experienced crews work on the tug boats. 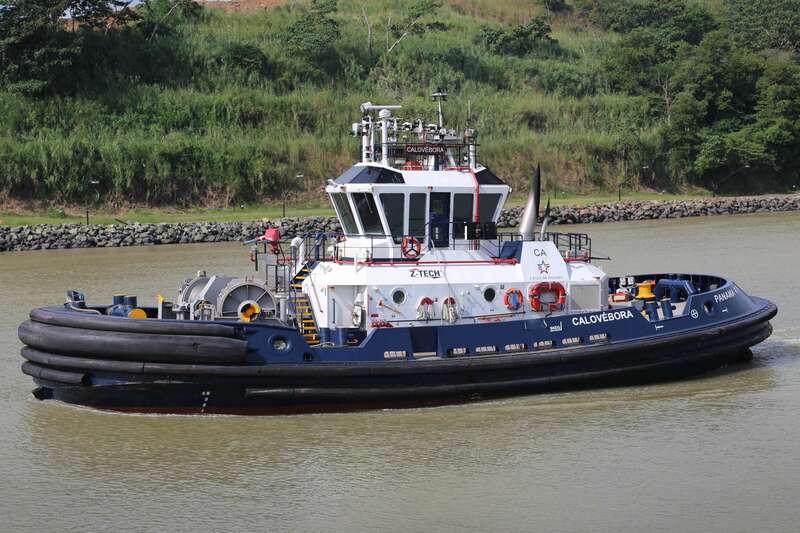 An accident could halt the profitable passage of ships at the busy Panama Canal. As examples, Suez was a trench dug from desert sand. Panama is a rain forest with ground made of rock, massive hillsides of unstable dirt, and a major river to contend with. Suez was relatively close to France, while Panama was half a world away. The Suez desert is hot but given water and shade, workers can toil on. Panama’s jungle climate included soul-sapping heat and humidity, and torrential rains that wreaked unrelenting havoc on men, equipment and terrain. In Panama, mudslides of hundreds of thousands of cubic yards of rock and mud were a common occurrence. Suez was virtually free of insects. Panama was rife with deadly insects, primarily mosquitos, and they would prove to be a scourge that cost thousands of lives. At Suez, Lesseps was able to use “forced labor” but for Panama he would have to pay for labor, driving up costs. 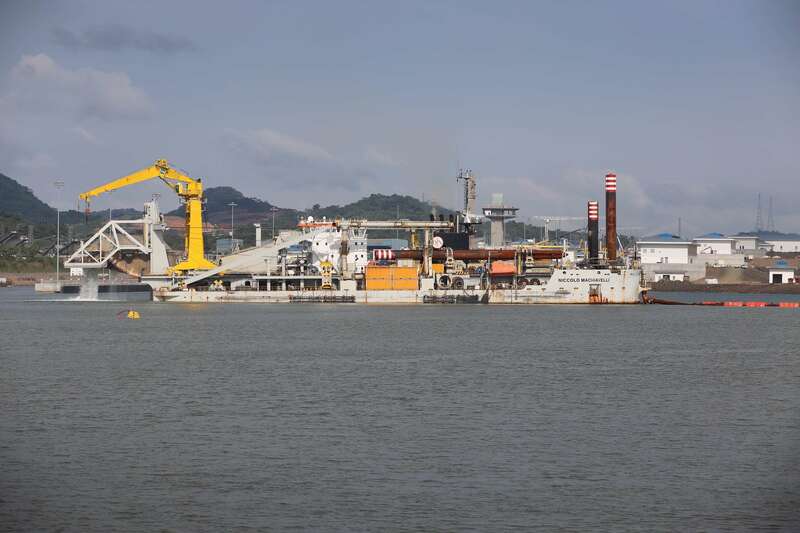 This odd-looking vessel is a dredging operation to make sure the bottom is deep enough to handle the giant ships that regularly travel the Panama Canal. 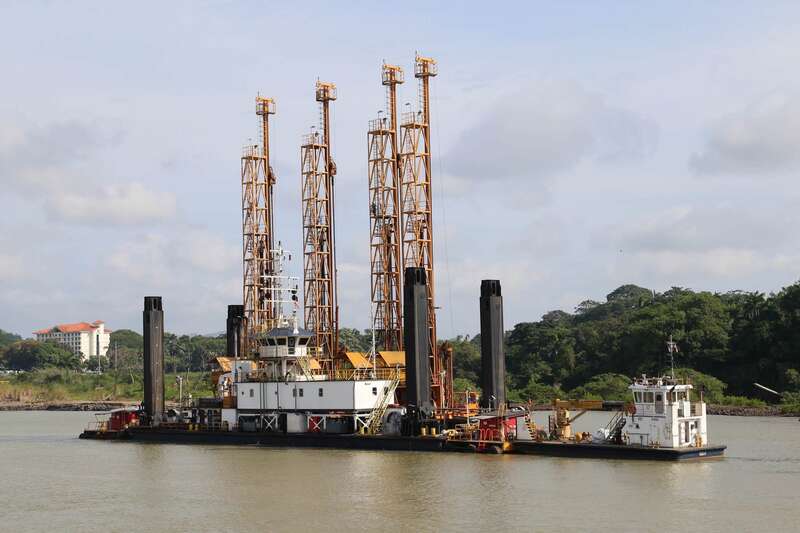 Dredging, core sampling and expansion work continues around the clock at the Panama Canal. The French effort, begun in the 1870s was doomed from the start. The project was simply too big, and the men and machinery of the day were continually outmatched by the rock, mudslides, near-ceaseless rains, insufferable heat and the constant threat of disease. 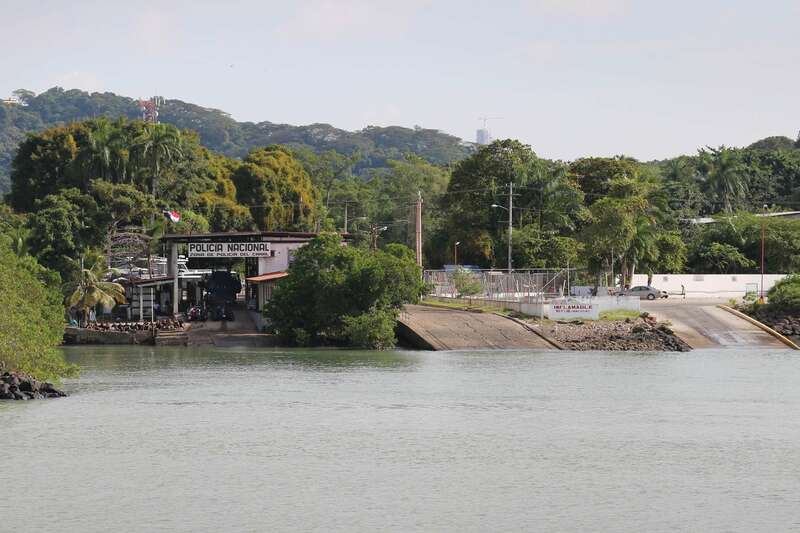 And even though Gatun Lake was 85 feet above sea level, Lesseps clung to the notion that he should build a sea level, not a lock-configured canal. 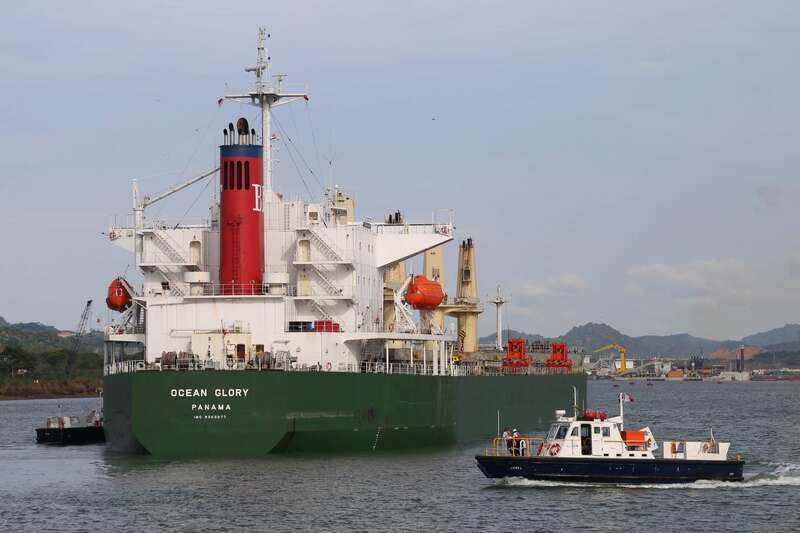 The cargo ship Gloria , barely visible now, passes the Miraflores Locks control tower on her way toward Panama City. Adding to their woes, the French were both ignorant of and highly susceptible to the ravages of mosquito-borne diseases such as malaria and yellow fever. For example, the French thought that small moats of water at the base of trees would be a good way to control the ants that roamed everywhere; the moats worked, but this created an ideal breeding ground for mosquitos. And all too often French administrators believed wanton living from drinking and carousing made men susceptible to malaria and yellow fever, so the focus was on morals, not science and medicine. It is estimated that upwards of 25,000 people perished, the great majority from disease. Regardless of size, every vessel pays a toll, how much depends on vessel size. This boat, heading to the Caribbean, had to plunk down around $2,000. Sadly and predictably, the French attempt collapsed under the weight of its own shortcomings. The great effort might well have been squandered altogether. But waiting in the wings was another interested party headed up by a stocky man with a large moustache who held an unbounded belief that the canal would be realized. Theodore Roosevelt wanted America to have the canal and he was determined to see it through. 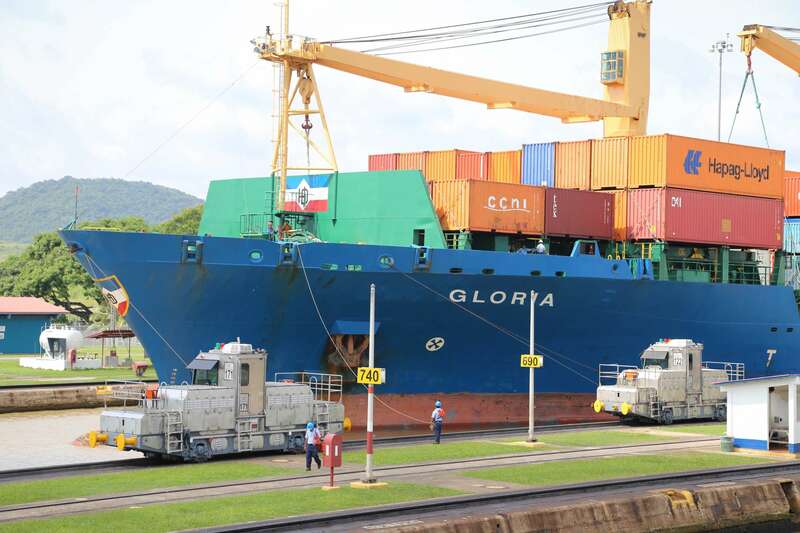 The container ship Gloria is escorted to a position in the lock. Note the level of the water before the lock is drained. At the time the French, and later during America’s initial involvement, Panama was the northern region of Colombia. The government in Bogota had granted a concession to the French, but when their efforts failed, American interests stepped in and wrangled a deal from the Colombians. As is often said, timing is everything, and in this case that fact greatly worked out to the American, as well as Panama’s advantage. 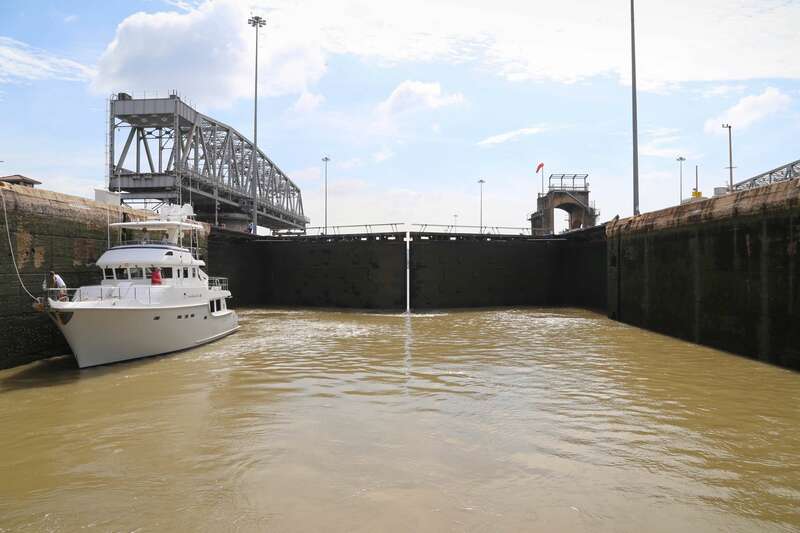 The lock gates are designed so that when they close, water pressure helps ensure a tight seal. Roosevelt made the canal a top priority and though he did not win a second term for the presidency, by the time he left office the project was well underway and firmly in the hearts of Americans. They now saw the canal as ‘theirs’ and were determined to see it finished. But Colombia became prickly and began making fresh demands for money and control, so the American government tacitly supported a Panamanian revolution. 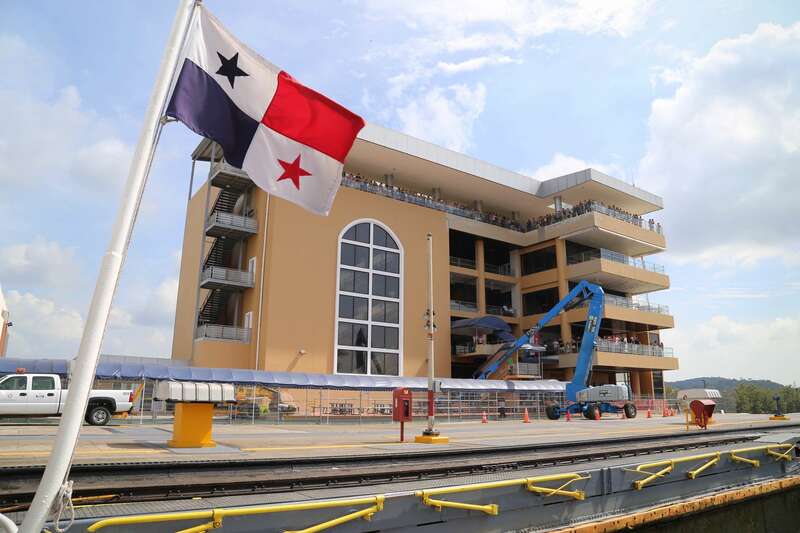 The new government in Panama was immediately recognized and they signed a highly favorable deal with the U.S. Everyone – except Colombia – was very happy with this new, tidier arrangement. 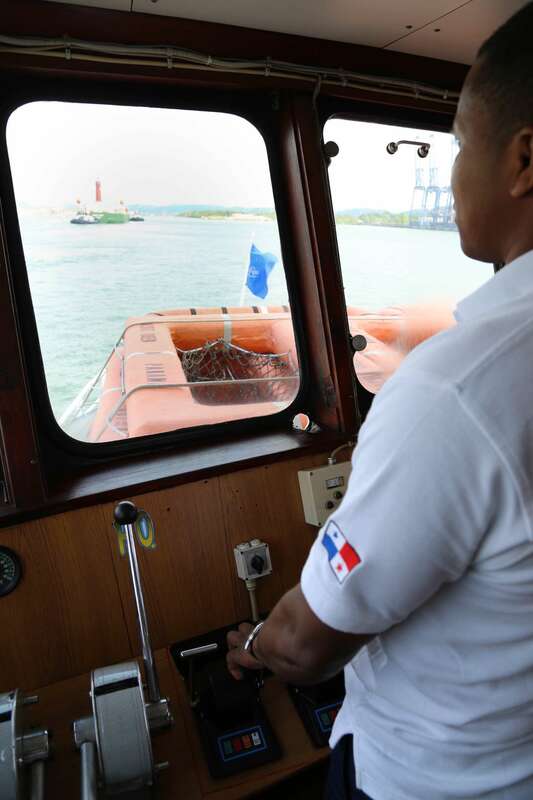 While the 20 or so men of the Panama National Police, to the left of the dock, seemed relaxed, they have the equipment and wherewithal to respond immediately to any problem within the Panama Canal zone. The passage of time from the initial French effort resulted in manufacturing advances and allowed America’s industrial infrastructure to mature. New, larger and sturdier equipment with greater heft were put to the task. Other important lessons were learned, such as abandoning a sea level canal and building one with locks. And the Americans focused on overcoming the ravages of malaria and yellow fever. That success virtually eliminated death by disease and greatly increased the morale of workers and their families. The big majority of ships move through the canal without heaving to. 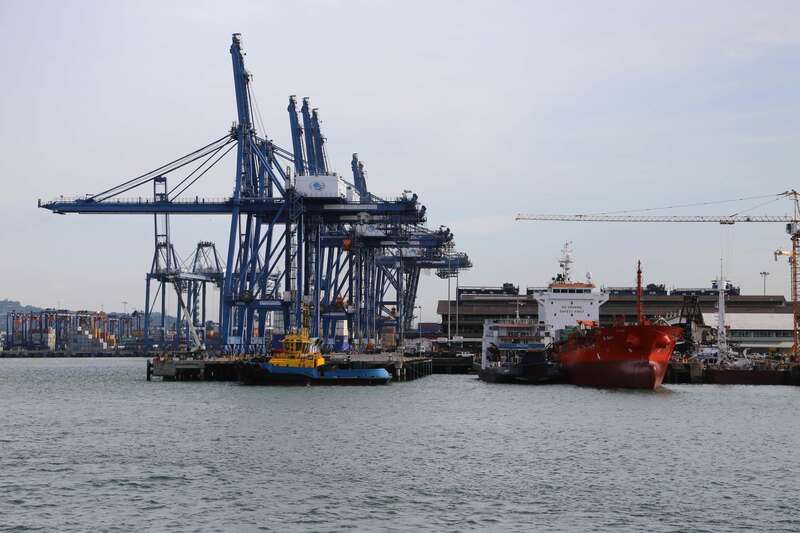 But some use the canal’s port container facilities to offload and take on cargo. Without a doubt the Panama Canal helped ensure America would cement its status as a world power. 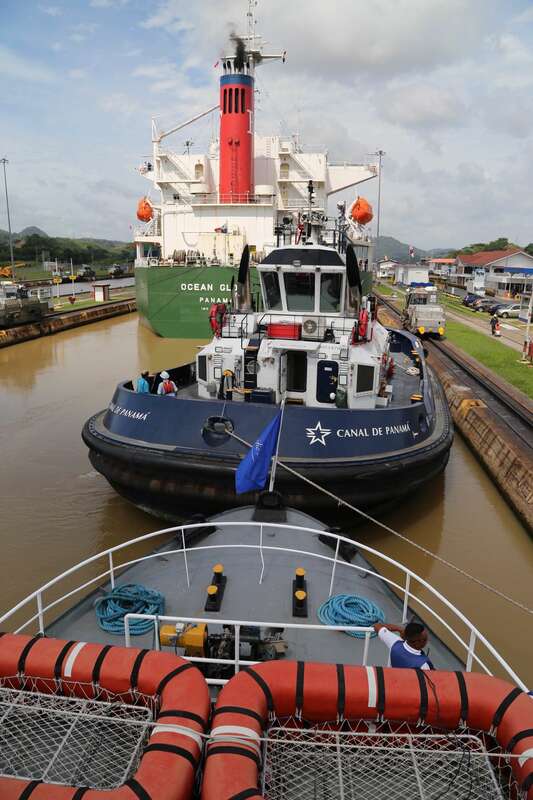 The canal remained under U.S. jurisdiction and control until President Jimmy Carter signed a treaty in September 1977 that returned the canal to Panama in 2000, who has owned and operated it since. The captain carefully guides his ship while the canal pilot keeps a close eye from a station in the wheelhouse. The display on the right shows the position (the black dot in the center). 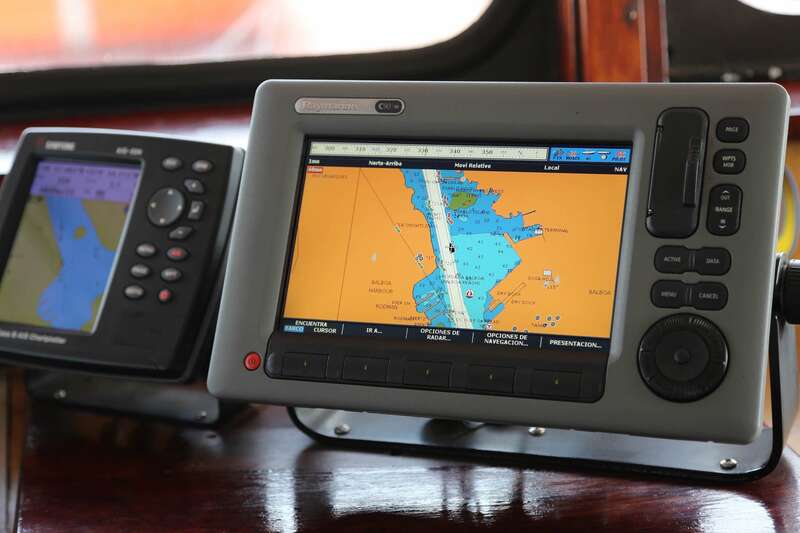 Stay in your lane and obey the canal pilot that sails on every vessel. Ultimately, the original canal, though still heavily used and responsible for helping move over $250 billion of cargo a year, cannot accommodate the ever-larger cargo and passenger ships that want to transit the oceans. 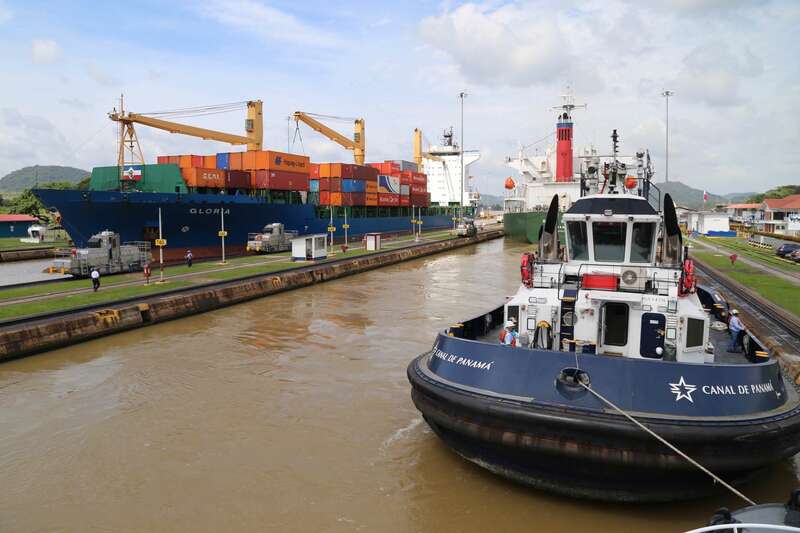 So, to accommodate the bigger vessels, remain competitive as a strategic transportation corridor, and stave off the possibility of an even bigger canal being built in Nicaragua, a new, much wider canal is under construction. The project began in 2007 and is expected to be complete in 2016. 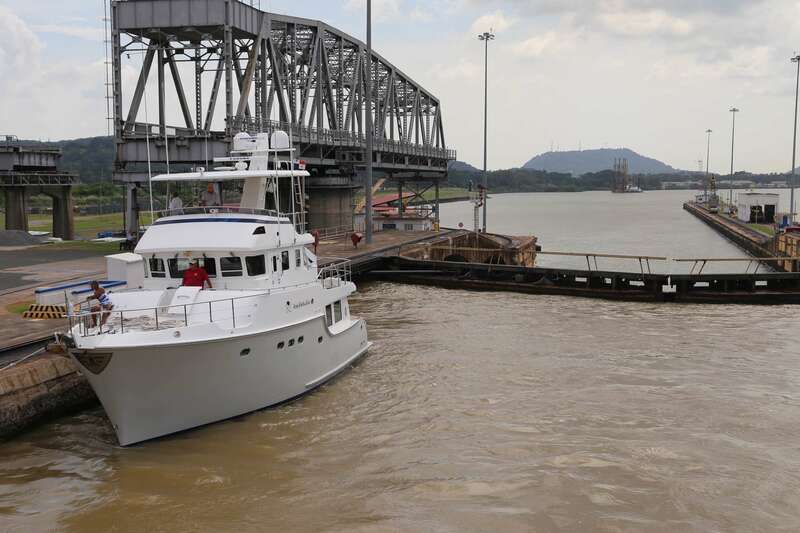 Once complete, the expansion project is expected to help the Panama Canal remain competitive for many decades to come. 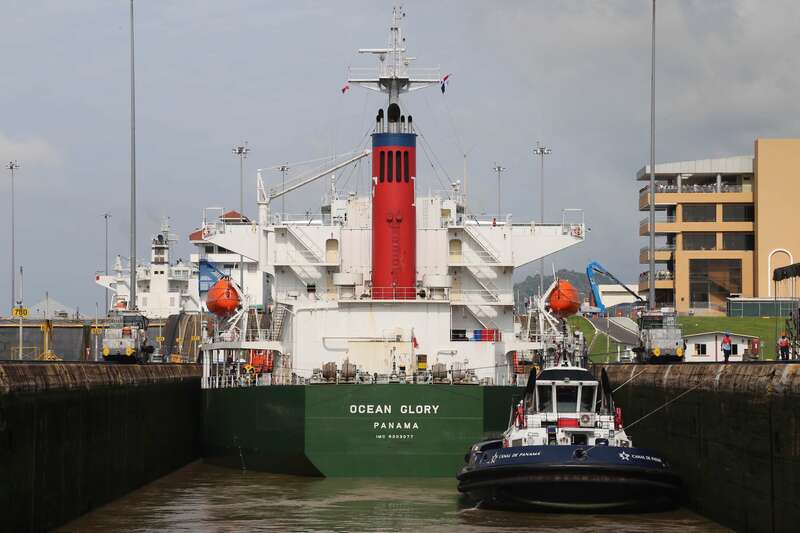 The Ocean Glory is just one of thousands of ships that move through the Panama Canal every year. 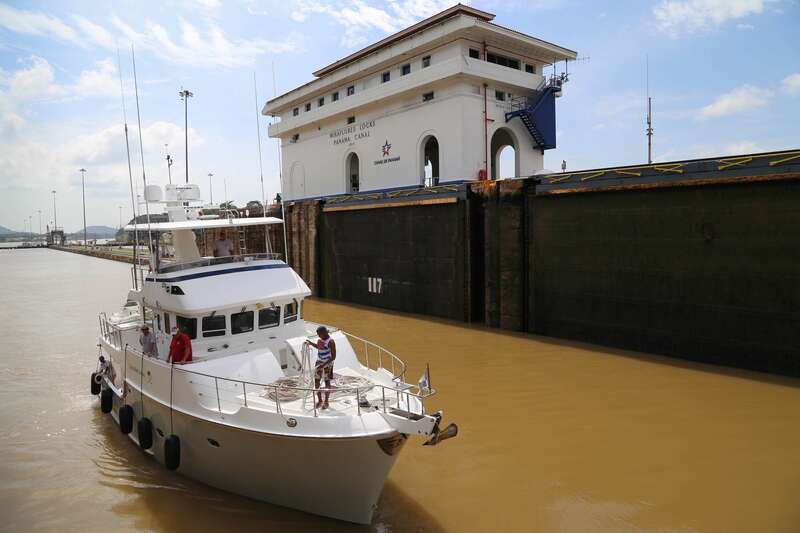 This entry was tagged A City A Month, canal, Michael Kardos, Panama, Panama Canal, travel. Bookmark the permalink.